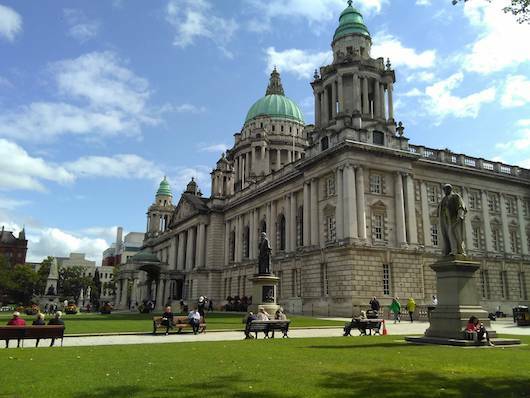 This is a 10k ‘runseeing’ tour, covering many of Belfast’s most important sites. We’ve tried to keep the number of turns to a minimum. A good place to start is Ormeau Rd. near the Radisson Blu., heading toward the river. The first part of the run is about 3 km along the river along the Stanmills Embankment, with the River Lagan on your left and the Botanic Gardens on your right. At the 2.7 km mark, reach a rotary at Stansmill College, continuing on Stansmill Rd. (busy road, decent sidewalk) to Malone Rd. Turn RIGHT on Malone, passing the U.S. consulate (behind trees) and some older buildings, for 1 km into the heart of downtown. At the 5.5k mark, we suggest popping over to Stansmill Rd. via Chlorine Gardens to pass by the Friar’s Bush Graveyard, Ulster Museum and Queen’s University, bearing right on University Rd. At Donegal, bear RIGHT on Dublin Rd., running through Belfast’s main shopping area. Bear RIGHT on Linehall St., and run toward the impressive Belfast City Hall, where you’ll around or through Donegal Square. On the other side of the Hall, continue on Donegan or Fountain (pedestrian zone), passing the the Castle Court Shopping Center, and then the Belfast Central Library, Ulster University, and Buoy Park. Run through the park or onto cobblestoned Exchange St., heading toward the river, through St. Anne’s Square (MAC Cultural Center, St. Anne’s Cathedral, War Memorial Museum. Continue on narrow but pretty Hill St., then LEFT on High St., and then RIGHT on Victoria St., passing the Albert Memorial Clock and Queen’s Square, back to the start. Shorter Option: You could focus mainly on downtown and save nearly 3 km — at the Stansmill rotary, take Stansmill Rd. to the Ulster Museum/Botanic Garden, and pick up the route above on University Rd.